THE HOUR OF THE TIME | Watchman - Declare What You See! Has Time Magazine just joined the “game” with the current issue of their magazine now available at your local bookstore? 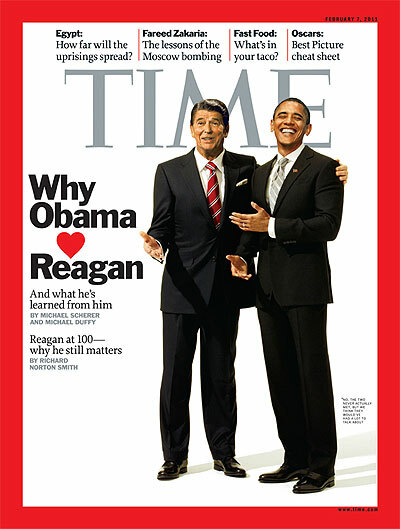 With Obama and Reagan pictured side by side on the cover of TIME, and then, Sarah Palin all but bowing down in worship of Reagan in her new book which portrays Reagan as her “idol” and “hero”, it’s as if a “Messiah” is about to return! Yahoo News just reported that Super Bowl XLV had the largest U. S. viewing audience ever recorded in history – 111 Million! 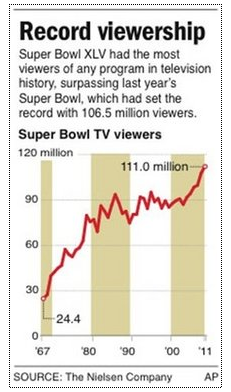 NEW YORK – For the second year in a row, the Super Bowl has set a record for American television viewing. The Nielsen Co. said Monday that an estimated 111 million people watched the Green Bay Packers outlast the Pittsburgh Steelers in professional football’s ultimate game. That tops the 106.5 million who watched the 2010 game between New Orleans and Indianapolis. you do know WHO owns Time magazine right?…….The Rothschilds. what are your thoughts on the ‘pale rider’? I don’t believe it is fake…..yes, of course people are ASSuming it is. Funny how when people see a video that seem’s too good to be true, that suddenly everyone becomes a CGI expert. Watchman….do you have a thread that post info about 11? I have stuff to add to perhaps keep our eyes open for. I’m not saying I’m an expert, far from. But I did see a video a few days before on how they make you believe it’s real, that’s all. Sometimes I ask myself the question if, they are deliberately making things up, sharing info on the net, which are so unbelievable so the people who talk about these stuff sound crazy, so that no one would believe them. For an example the reptilian conspiracy! is it true? I don’t know. Do I talk about? NO, NO, NO cause if I would, I would sound crazy and there’s no one who would believe me anymore. Regards, and keep up the good work. The truth is out there, people just have to become aware, which, in my opinion ain’t that easy. just wanted to say thanks again for the education , my wife and I are rereading all of your archives again and we pick up on symbols and numbers now, for example the crop circle of the phoenix in your blog such as the 3 claws on each leg the 3 circle emblems at the feet and at the top the emblem that looks like an alarm clock also the phoenix has just started on fire, so is this stating that the burn down is in the process, and the way I understand it the phoenix sets it’s self on fire for the planned event for rebirth.. their is so much more from your articles, we could go on and on about them. and we look forward to each new posting.. thanks your brother in Christ Jesus our Lord. Thank you Chuck! It’s really nice to know that people are receiving “insight” from my postings. There is so much that could be stated about the things that I cover, that I have a hard time knowing exactly when to stop writing a given topic. If you’ve noticed lately, some of my articles have been “linked” to other sites for clarification, or further research by the reader, with less comments coming from me. forgot to say that now obama is calling himself the gipper, if you caught that on the drudge report. Hi Chuck….what is a gipper? I have looked for that name and I am not finding the meaning.